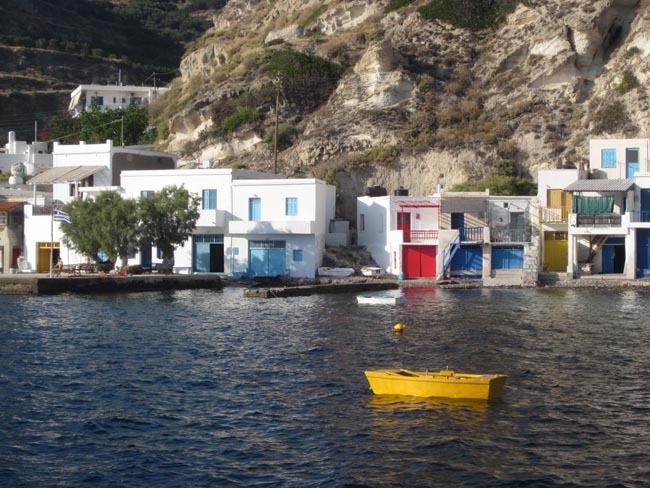 Find peace — and the sweet sound of cicadas — in Milos, Greece. The cicadas, again. 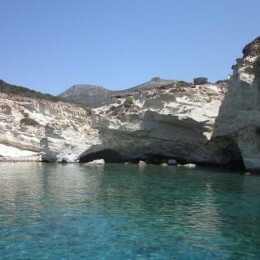 We are sitting at a small table on the edge of the seashore in the bay of Adamas, the main port of Milos, wondering why we are leaving this place after three nights. A lone seagull floats by and the gentle wind sends ripples across the water. We sip our fresh orange juice, immersed in the moment. I gingerly creep down a few rocks into the water and swim out above my head almost to the boats anchored nearby. Irwin is immersed in a book I have already finished: The Debba by Avner Mandelman is a raw, cynical portrait of life in Israel in the late ’70s, the story of an expat Israeli who returns for the funeral of his father and confronts his brutal and kind past in the 1967 war. We arrived here without a reservation and, after some walking in the heat, found a huge and tastefully decorated room above a pizza restaurant, at 50 euro a night. It was there that we met the boisterous Georgia, who used to live in Quebec City and studied at Concordia. I had too much Georgia on my mind very quickly and settled in to our luxurious accommodation, which had air conditioning, a fridge and beautiful secluded balcony overlooking the bay. For dinner we took Lonely Planet’s recommendation and dined at Flisnos, eating superb small fishes and lightly battered calamari, the freshest in our memories. We were happy that the owner hired two people from outside the norm: one waiter had Tourette’s, the other was outwardly gay. What the owner did balk at was my feeding fish heads to the local cats, but I persevered because I’m the daughter of the cat-loving Eva and the mother of Molly. After dinner, we shopped for a boat trip because we were told by Georgia and others that these day-long excursions are the only way to see the whole island. We found a big and comfortable boat and signed on for the next morning for 30 euro. We brought our own drinks, luscious cherry tomatoes and baked goods, spinach and feta. The trip was awe-inspiring. We stopped three times to swim in pristine turquoise coves. I descended the ladder into the deep water and floated merrily beside Dutch children. Never have I enjoyed swimming so much. We stopped to view caves and gorgeous little villages and volcanic formations along the way. Our colleagues included Dutch, French, Italian and Greeks. 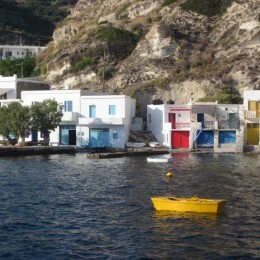 The Germans seem to be boycotting the Greek Islands. We arrived back at 7 pm after a splendid day and disembarked to police counting our heads to see how many more than the allowed 50 passengers our captain had managed to sneak on. There had been about 60 of us. We are sitting in Aktaion Café Pizza sipping Cappuccino Fredo in the main port contemplating our next meal, which we will purchase from the supermarket (east least part of it) before we sail off tomorrow morning to the isle of Folegandros. 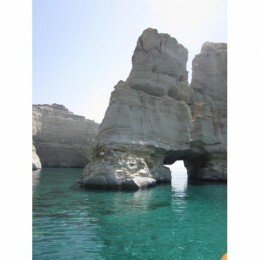 There is peace — and cicadas — in stunning Milos, Greece. 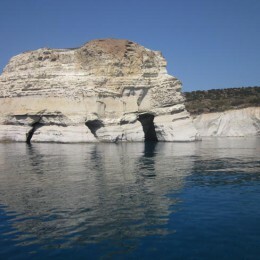 Milos is a volcanic island in the Aegean Sea north of the Sea of Crete. 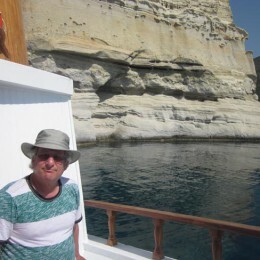 It is south and west of the Cyclades. The island is famous for the statue of Aphrodite (Venus de Milo) now in the Louvre, and also for statues of the Greek god Asclepius (now in the British Museum) and the Poseidon and an archaic Apollo in Athens. The combined land area is 160.147 km and population is just under 5,000. Be the first to comment on "Milos on our minds"